Anna J. Siefken has been named the inaugural executive director of Carnegie Mellon University’s Wilton E. Scott Institute for Energy Innovation, effective Aug. 1. 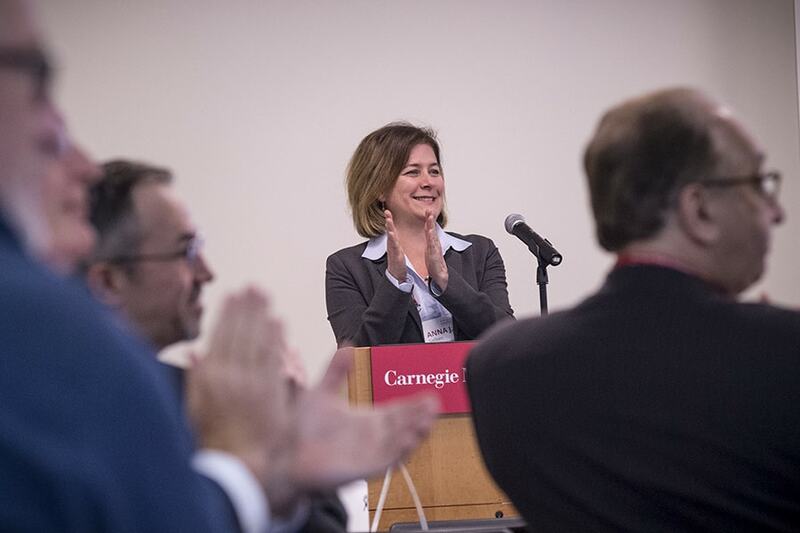 Previously, Siefken was the Scott Institute’s associate director for Innovation and Strategic Partnerships, a role in which she deepened engagements and developed an innovative partnership strategy that promotes collaboration with industry, government, nongovernmental organizations, foundations, universities and several of Carnegie Mellon's energy-related centers. The strategy focused on research, commercializing technologies, education and outreach. A recognized leader in the promotion of energy efficiency, green initiatives and environmental practices, the National Renewable Energy Laboratory recently selected Siefken as a member of its national Executive Energy Leadership Academy cohort. She frequently speaks on energy, sustainability and academia’s growing and central role in the smart cities innovation ecosystem. The Scott Institute’s mission is to promote research and education focused on improving energy efficiency, creating innovations in energy technologies and broadening the world’s mix of energy sources in a way that is sustainable, reliable and affordable. Its many efforts aim to connect over 140 energy innovators, researchers and faculty across the university and beyond to enable more substantive, free-standing energy research efforts. “The need for new technical and policy-based solutions to address the world’s energy challenges is unwavering, and I think Anna is an outstanding choice to serve as executive director of the institute as it moves into its exciting future,” said Scott Institute Director and College of Engineering Trustee Professor in Energy Jay Whitacre. An adjunct professor in CMU’s Heinz College of Information Systems and Public Policy, Siefken’s recent work focuses on creating a “Smart Data Utility” in Pittsburgh. Working with the City of Pittsburgh and the major utilities in southwest Pennsylvania, she advised students in the Master of Science in Public Policy and Management program as they developed a three-pronged deployment strategy, including the creation of a digital platform that would map Pittsburgh’s underground infrastructure. The map alone, the students suggest, could save millions of dollars each year by leading to greater efficiency and cost-sharing during the long-term planning process. Future efforts will explore the role and integration of grid-scale renewables in the region. Prior to joining Carnegie Mellon in 2016, Siefken was the Pittsburgh 2030 district director and vice president of Strategic Engagement for Pittsburgh’s Green Building Alliance, one of the largest regional chapters of the U.S. Green Building Council. She is a founding member and on the executive committee of the international 2030 District Network’s board of governors. She also serves on 412 Food Rescue and the Mt. Lebanon Historic Preservation boards. An accredited professional in Leadership in Energy and Environmental Design (LEED AP), Siefken previously worked as principal consultant at ICF International in Washington, D.C., managing corporate, retail and manufacturer relationships for both the U.S. Environmental Protection Agency and the U.S. Department of Energy on the Energy Star retail and products programs. She earned her green — and orange — stripes as a merchant and environmental program manager at The Home Depot headquarters in Atlanta. She is a graduate of Duke University. Siefken received the Pittsburgh Business Time’s 2016 Women in Energy Leadership Award, a spot on the Smart Business Pittsburgh Magazine’s “Who to Watch” list in 2017 and the 2018 Women of Achievement Award from Cribs for Kids. Anna J. Siefken is a recognized leader in the promotion of energy efficiency, green initiatives and environmental practices.